Sabouru is a traditional kissaten in Tokyo (traditional Japanese cafe), that stands out because of its cottage style front and unique interior. It is located in Jimbocho, also known as book town. I do not know how to exactly describe this place, I heard the words cute, retro, special, traditional, showa-style and many more. 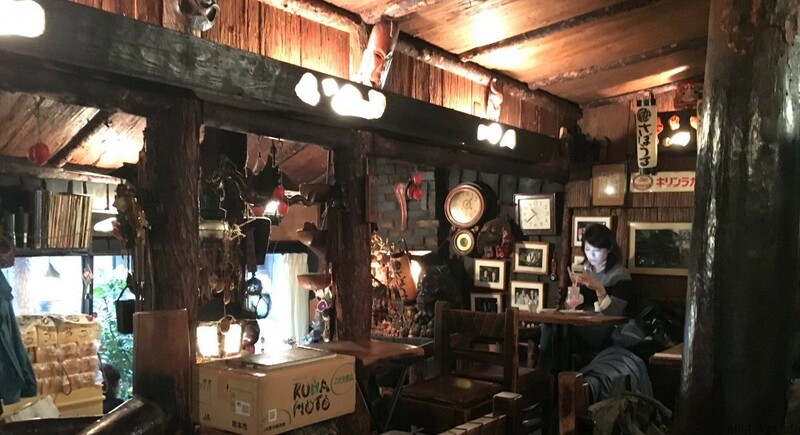 Fact is that this place, started in 1955, fits the traditional kissaten description with the type of drinks and foods that they serve, such as the morning set with coffee that consists of butter toast, veggies and, of course, coffee. 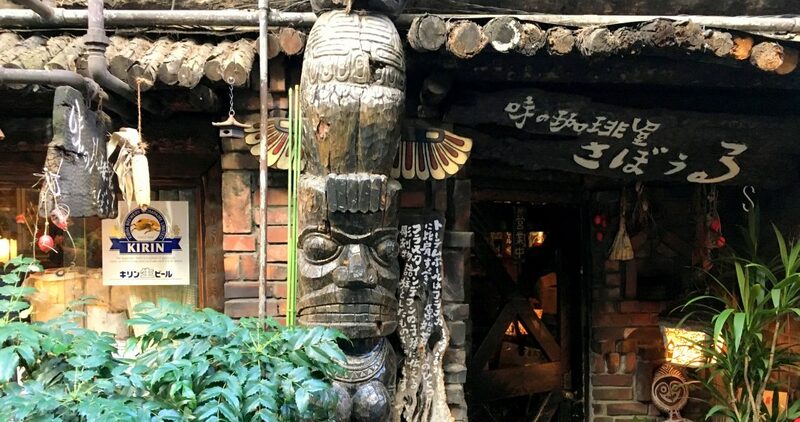 What is different is that they took the kitsch approach a step further with the peculiar native american inspired wooden front with red telephone, and wood carved fantasies inside of the cafe, African masks, dragons on a wire and some other randomness thrown in. The name of the cafe, sabouru, means to “skip school”, hence, it was/is a popular place for university students. Coincidentally, sabouru also means “taste” in Spanish, but I guess the Japanese meaning takes precedent here. Coffee is the thing you should get here. I particularly liked the ice coffee, which is made with very clear (almost transparent) ice, rather beautiful actually. Another thing that you will see being ordered is the popular pink fresh strawberry juice, served with peanuts. By the way, the morning coffee is also served with peanuts, an interesting combination I thought. Later I found that this is a common snack with the Ethiopian coffee ceremony. Inside of the cafe, you have some tables upstairs and downstairs, both levels open towards the front. The cafe is packed with rather small tables and small chairs, which I did not find it that relaxing as my legs were too long. However, most of the customers seemed to fit perfectly and enjoyed their stay in this cozy, dark and smoky environment. I visited on a Saturday morning, when most customers were one person customers, men and ladies savouring their coffee and the morning breakfast set. Next door they have the shop Sabouru 2 that focuses on food rather than coffee. The main attraction there is the Napolitan spaghetti, a type of spaghetti originating in Japan after the second world war with tomato ketchup, vegetables, sausage or bacon and tabasco sauce. Opening hours: Monday-Saturday 9:00-23:00. Closed on Sundays. When to best visit? can get crowded on Saturdays. When visiting Saturday morning around 10:00 there were still places. Why visit? Hard to find a more unique place to get your coffee in Tokyo.